Ever since we announced our part in the BOOM exhibit at Seattle’s Center for Architecture and Design, we’ve been hinting that something more was coming soon. Indeed, something has blossomed from our collaboration with Seattle’s builders and designers. And now we’re cheek-splittlingly pleased to announce that we’re teaming up with City Councilmember Lisa Herbold to host a Residents Podium for Seattle Legacy Spaces. You might see these flyers for the Residents’ Podium floating around town (click to enlarge). Historic Seattle’s Eugenia Woo will be one of our speakers. Image credit: Joe Mabel. 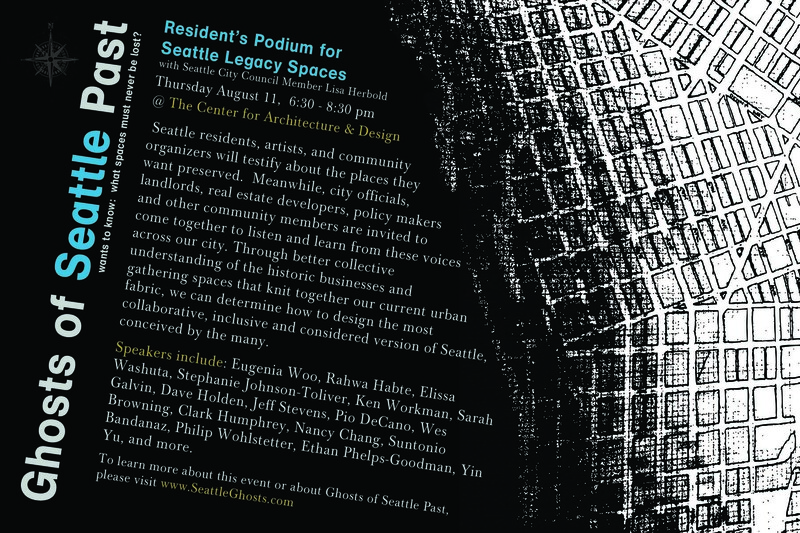 On the evening of August 11 (6:30-830) we’ll be gathering two groups of critical Seattleites at the Center for Architecture and Design. At the mic will be residents, artists, and community organizers, testifying on behalf of critical Seattle spaces. And in the audience will be developers, policy makers, and city officials. For one night, folks who are living everyday impact into their neighborhoods will act as advisors to the city’s large-scale shapers. This isn’t just a “let’s lament” event for places that are already gone (although those are powerful and necessary). Our speakers on the 11th will be highlighting the places near to their hearts—keystones of community that Seattle cannot afford to lose. Local policymakers and developers will be there to listen, to consider the direction of the city. And maybe, just maybe, going forward they will be able to allocate subsidies to offset rent hikes. Perhaps they will help to secure these beloved spaces before they’re caught up in the sweep of rapid growth. Ghosts’ team and City Councilmember Herbold aim to give the architects of our future city the input they need to build the most collaborative, inclusive, and considered version of Seattle that they can. With these speakers (and maybe more! ), we’re so grateful to put these stories in the hearts and minds and hands of those shaping the city for future generations of Seattleites. You can read more about the event on the Center for Architecture and Design’s site. We hope to see you there.